Lenovo has refreshed its line of ThinkPad notebooks with six new models aimed at business and other professionals looking for a strong blend of performance and battery life—and one of them can run up to 30 hours on a standard 9 cell battery and an option 9-cell slice battery. The lineup also features models with switchable Nvidia Optimus graphics (for both graphics power and battery-sipping capabilities), along with technologies designed to enhance voice and video calling capabilities. The new notebooks are dubbed the ThinkPad T420, T420s, T520, L420, L520, and W520—and one key feature common to all of them is improved battery life, with the T420s offering up to 10 hours of running time with a six-cell battery and a second option battery installed in its optical bay, and the T420 takes that even further, offering 15 hours of use on its standard 9-cell battery. Need more? 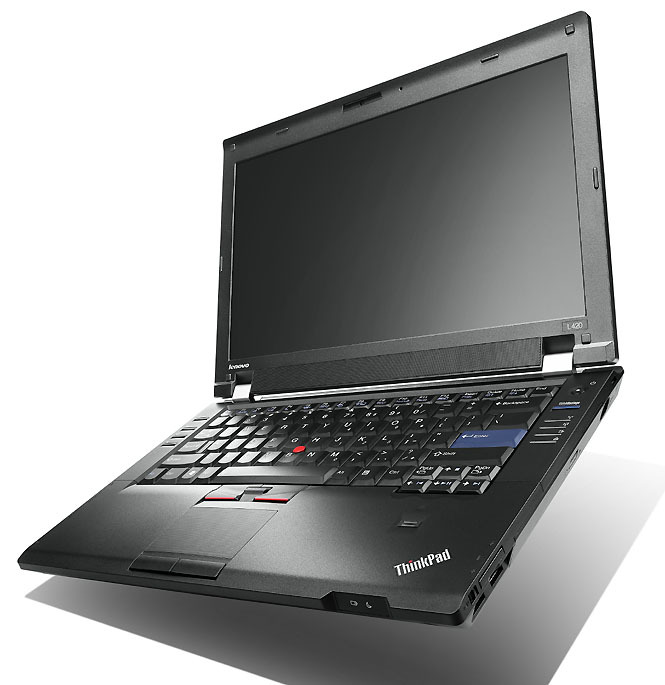 The T420 can stretch out to up to 30 hours with its 9-cell battery and an optional 9-cell slice battery, making them strong contenders for business travelers and others who spend long periods away from wall power. And that T420s weighs less than four pounds. 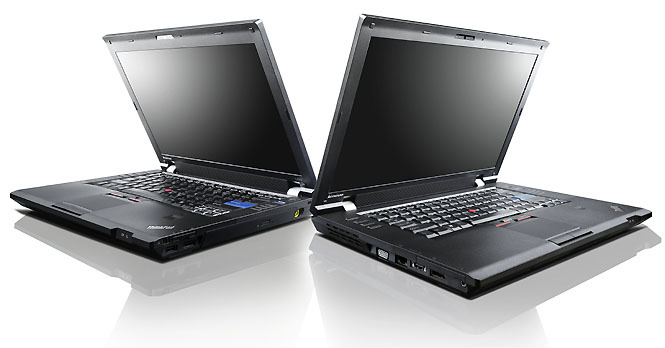 Folks looking for graphics performance can check out the new entries in the ThinkPad T-series and W-series that feature Nvidia Optimus graphics, enabling users to switch between battery-sipping integrated graphics and performance discrete graphics as needed—and get up to 33 percent better battery performance compared to previous models with discrete graphics. All the new ThinkPads include enhanced video and voice calling features, including easy switching between Private Chat and Conference Call microphone modes (Conference call captures a 360° space, while Private uses cancellation technology to focus on just one voice up front). 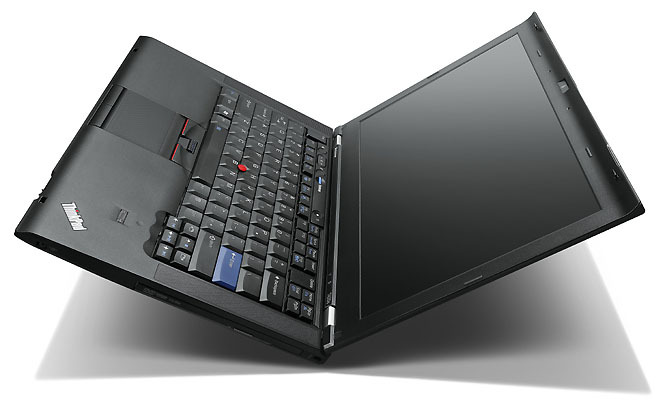 The ThinkPads also feature keyboard noise suppression technology and a dedicated LED-lit microphone so users always know when they’re transmitting audio. The new ThinkPads will be available with Intel’s Sandy Bridge second-generation Core processors or Core VPro processors, and feature multiple layers of security (including encrypted hard drives, remote management support, and fingerprint readers). The notebooks also feature Lenovo Turbo Boost technology that helps keep processors in Intel’s Turbo Boost mode for longer periods, smart power management, and Lenovo’s Instant Resume feature that maintains users’ wireless connections during sleep for up to 99 minutes so folks don’t need to re-authenticate to wireless networks when they wake the notebooks up. Lenovo says the new ThinkPads will be available in March. The T420 will start at a suggested price of $779; the T520 will start at $909, the L420 and L520 at $719, and the high-performance W520 will start at $1,329. And that sub-four-pound T420s? It’ll also start at $1,329.